Joni and daughter, Kilauren Gibb, reminisce about their reunion. Joni also can be seen with her grandchildren, Marlin and Daisy. Joni is heard singing Stay in Touch. I feel that Joni's world is complete now that she has her daughter and grand children in her life. 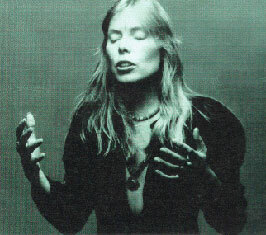 In my book, Joni is the finest singer songwriter and painter who has ever breathed.